Indelible Acts: Stories, A.L. 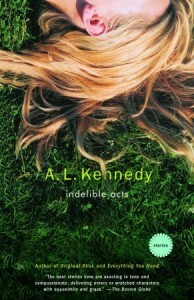 Kennedy, Vintage, 2004, ISBN 978-1400033454, 204pp. I picked this up on the recommendation of a travel guide book, as an example of good writing by a Scottish author. The writing is very good, but the Scottish nature of these stories is near to non-existent. What connects these stories together is their theme of adultery, a theme that is fairly common to mainstream literature these days (I’ve an aunt-in-law who used to complain that it was a criteria for Oprah’s Book Club), but one that I had heretofore avoided in my own reading diet. Unfortunately, the saliciousness of these short stories was fairly mild, and while I found Kennedy’s writing quite admirably, at the end of each story I found myself saying, “So what,” a common complaint I have with modern short stories, which tend to be heavy in style and character and light in plot or substance. I did end up reading every story, so that’s something of a recommendation, in the sense that if plot isn’t necessary for you, you might find this book quite worthwhile.